Infrared satellite imagery provides temperature data, and when NASA's Aqua satellite passed over Tropical Storm Wukong, the coldest cloud tops circling the center resembled a strawberry and leaf. 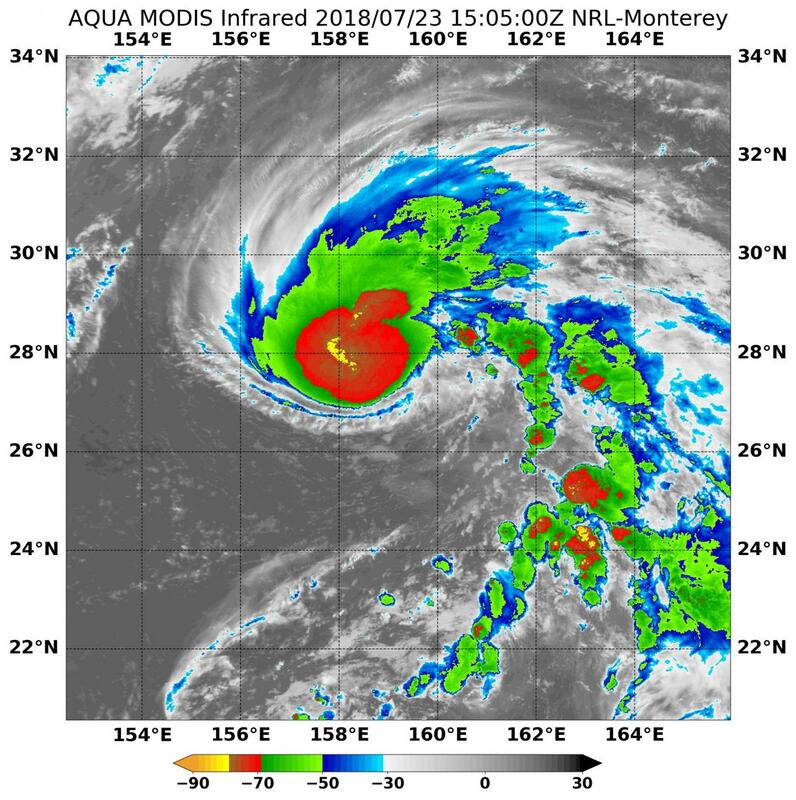 The Moderate Resolution Imaging Spectroradiometer or MODIS instrument aboard Aqua provided that infrared data on July 23 at 11:05 a.m. EDT (1505 UTC). MODIS data showed the strongest thunderstorms were as cold, or colder than minus 70 degrees Fahrenheit (minus 56.6 degrees Celsius). NASA research has found that storms with very cold cloud tops have the potential to generate very heavy rainfall. Those storms circled the low-level center and extended into the beginning of a fragmented band of thunderstorms to the northeast, which made it resemble a leaf attached to a strawberry. The strawberry-like shape suggests that the storm is being affected somewhat by low westerly vertical wind shear. At 5 a.m. EDT (0900 UTC) the center of Wukong was found near latitude 30.9 degrees north and longitude 158.8 degrees east. That's about 437 nautical miles northeast of Minami Tori Shima Island, Japan. The tropical storm was moving toward the north near 9.2 mph (8 knots/14.8 kph). Maximum sustained winds are near 51.7 mph (45 knots/81.3 kph) with higher gusts. The Joint Typhoon Warning Center noted that Wukong will move north-northwest and turn extra-tropical far to the east of Japan.